Quadcopters, Hexacopters and even Octocopters are the new craze nowadays or in short radio controlled drones as they are getting smarter and easier to pilot. The interesting thing is that for many people it is not about the flying, but the aerial photo and video recording why they are buying these gadgets. If it is for filming or video monitoring then you might be able to replace the standard video camera with a thermal camera and enhance the capabilities of the drone, but the problem is that most thermal imagers are either too big for a quadcopter or too expensive to even consider. The good news is that there is already a compact and affordable solution to add thermal imaging capabilities to your drone. The project is called DroneThermal by Flytron and is a micro thermal camera based on FLIR’s Lepton core – an 80×60 thermal imaging sensor. 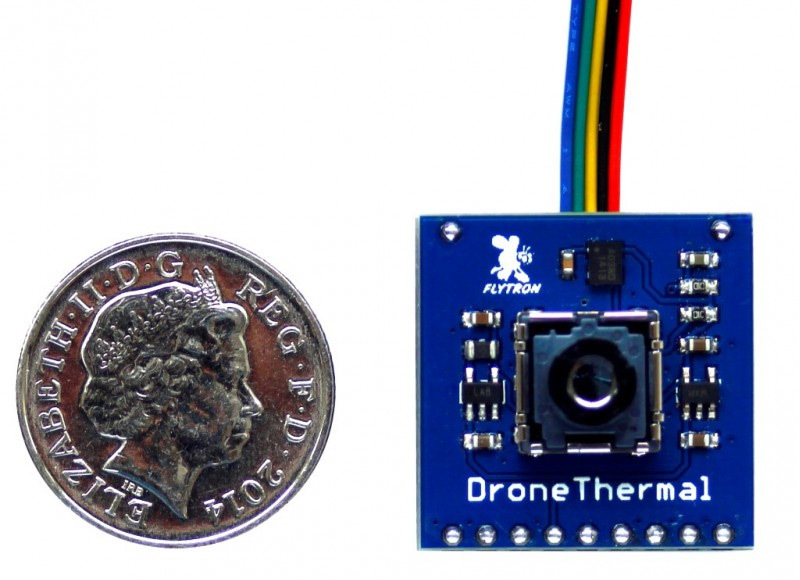 DroneThermal is the first micro size and low cost thermal camera for small UAVs and surveillance drones that offers direct analog (PAL/NTSC) output, so you can easily attach it to a standard analog video transmitter. If you add a second video transmitter or a multi channel video switcher to your drone you will be able to have both normal video and thermal image available from your drone transmitted to you on the ground. Although we said affordable, you should be aware that the DroneThermal module with the thermal imager is not that cheap with a price of a bit less than $500 USD, but that is much less than other thermal imaging solutions suitable for drone use.